Miss Debbie and I need something lighter to carry on top of our Ford Explorer while pulling our camper. Something us old folks can load and unload. She loves camping for the fun of the camping itself, but I gotta go on the water. I can't just hang around the campsite doing whatever campers do. We explored small aluminum boats and used "flat-back" canoes. All were too too heavy for us. Newer, and more exotic flat-backs are out there, but for at more expense than we can squeeze into our (read that as "my") boat budget. So, back to the drawing board---well, not exactly. It's back to the Master's computer design program. I spent some time with Graham while at the messabout working on a new design. Since then, I've been back-and-forth with Alan (the Young Master) by e-mail. 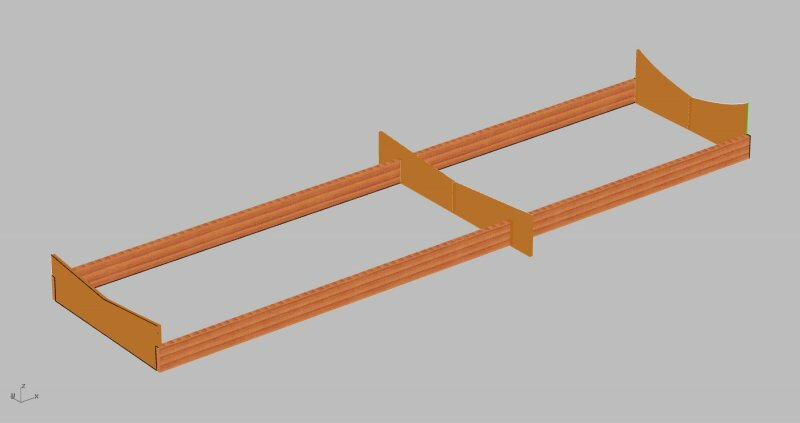 The following sums up the design parameters so far. Hey, how'd ya like that fancy, big word, y'all? We need the weight to be 65# or less if possible. Length will be 14~16 ft, depending on meeting that weight. Beam around 39 in. Probably two seats for a 14 ft. boat, or three for a 16 footer. The front seat needs to be far enough back to give foot room. The seats will be "box seats" to give support to the hull bottom and to hold flotation foam. All plywood will be 4 mm with an extra layer "doubler" in the hull bottom for stiffness. Naturally there is a "flat back"---a transom---for the motor. An electric or small gas outboard is planned. In my case, Mr. Zuki will provide power. He already does duty as power for Turtler, and as an auxiliary for Summer Breeze. I LOVE that little motor. In order to be classified as a canoe by the US Coast Guard, the transom must be no more that 45% of the maximum beam. This lets us avoid the flotation, upright-and-level, and safe loading requirements. These would be impossible to meet in a canoe-type hull. We need the hull to be narrow enough to paddle back into those shallow, swampy areas I enjoy so much. Maybe Alan will post a picture of the design. I'm not sure if it's been updated to the latest thinking, or if it's still where graham and I left off at the messabout. The plan right now is for B&B to draw the hull panels out full size on heavy paper that can be rolled and mailed to me. I'll then transfer that to the actual plywood that I have left over from previous projects. If all goes well, the plan is (probably-maybe) to develop it as a stock plan. 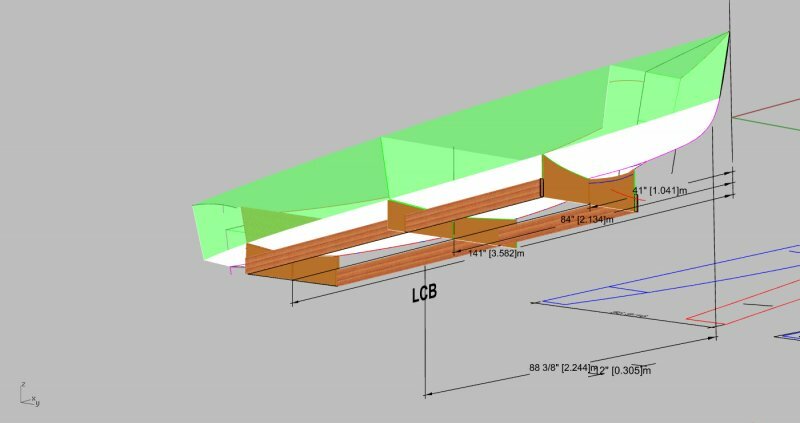 Maybe we can call this canoe a "Moccasin on steroids". Hmmm, a little humor? A VERY little! Oh well. I'll keep you posted as this project progresses. Let's have your input. especially if you are interested in one of these for yourselves. Well, Miss Debbie just called. time for lunch! See ya later, alligator! We've talked about this already, Chick, but let me weigh in on the matter here on the forum. This is the best way to really open the "debate", I think. I really don't think you're going to gain much over the Turtler. 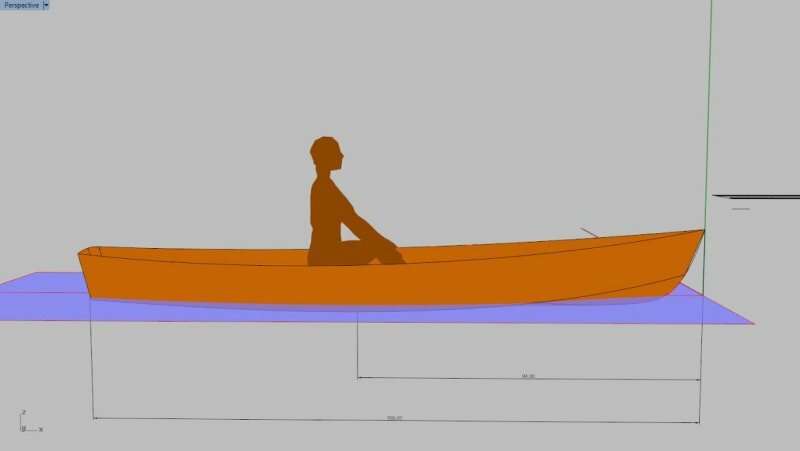 In the end, I believe that a "motor canoe" is going to end up being only about 30-40 pounds lighter, and a whole lot less stable. If this car-topper is the future, I am serious when I suggest hacking 3' off of the Turtler. Check with B&BYD on the hydrodynamics, but I'll bet you're gonna be OK.
NB: I believe that a "red herring" statement is a great way to get the debate going. Please don't hold it against me, especially the herring. All I can say, Don, is that I've always known there was something "fishy" about you. Ha!!! Ya fell for that one "hook-line-sand sinker". I don't want to alarm you, but in that shot from the starboard aft quarter, she appears to be filling with water. You know somebody needs to make a model, right? No, Robert, the water is supposed to be there. This is a special "bottom-less" design. Leaving the bottom off saves weight and material cost. To compensate, the sides are filled with helium, and the people wear special anti-gravity suits that are still in the developmental stage. 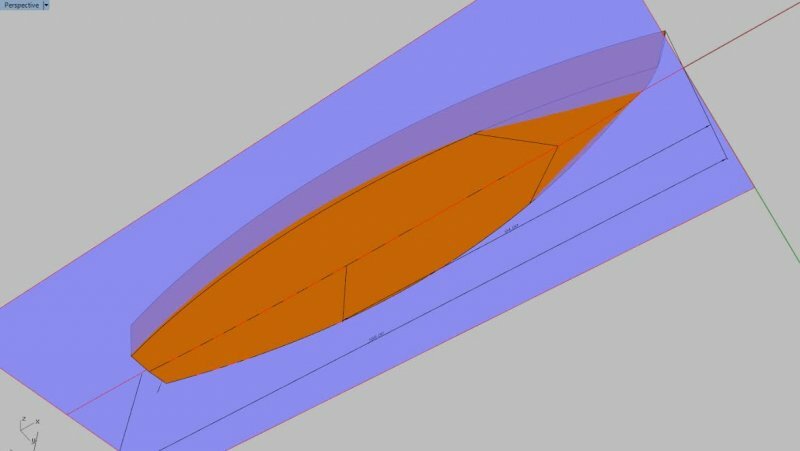 So far, there is no plan for drawings that you could build a model---or boat from. 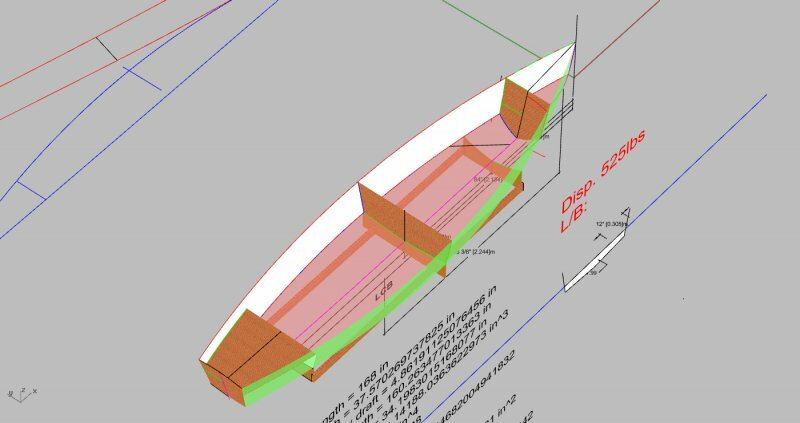 The first boat will be built either from panels cut on the CNC machine directly from the cut files, or from paper patterns drawn by the CNC. Hopefully there will be enough interest to finish the design for plans and/or kits. 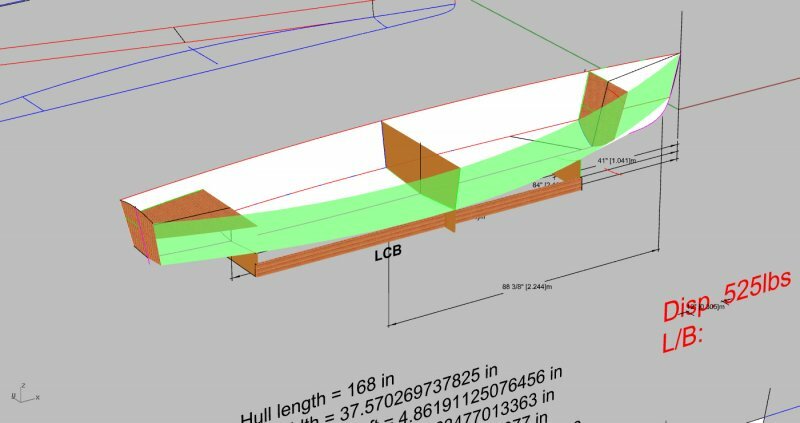 If y'all like the idea of this boat to become a stock design to go along with B&B's canoes and kayaks, let Graham or Alan know! But I wanna build mine over the winter and can't wait for further development. gotta have it to cartop while pulling our camper to all of those cool mountain lakes just waiting for exploration. Okay. So, you're building the model? Shoot, man, print them panels on paper, glue it to some Bristolboard or basswood, glue it up, and stick it on the shelf to drive you wild until you finish. 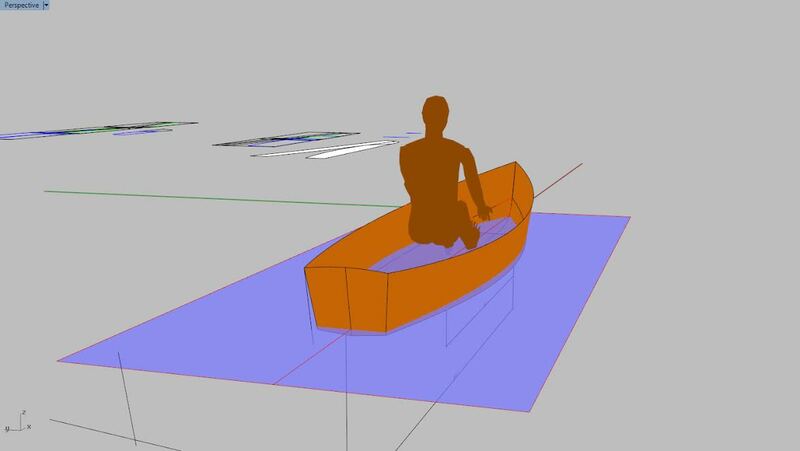 That's what I did with my little canoe in my avatar. It really does look like it's going to be a neat little boat, Chick. I'm all in favor small, low powered boats. My scene, if you will. If you fill the side panels with a helium based trimix type gas, it could be a deep submersible, too, the drivers breathing from the side panel tanks. Robert, no, not building a model. The "paper patterns drawn by the CNC" are full size. I'll trace around them to make the full size panels to build the boat. Maybe I can shoot them with a shrinking ray of some kind to get them down to model size. (One of my other two hobbies IS model building---mostly electric power r/c airplanes.) Then I'll have to find a correct scaled down Zuki 2.5 to put on it, and a really little man to drive it. Good idea on the trimix. Maybe nitrogen instead of helium. Strike a match and it becomes an awesome fireworks display. Kinda tough on the driver/diver(s). Wet them down real good and toss them in the clothes drier for an hour or two - they'll shrink up. Doggone, I KNEW that Paul would have the answer---ya just can't beat all those years of experience! Oh. I figured part of the fuss about computers was you could print files in any size. I guess I just figured a set of panels could be printed in scale on legal paper or somesuch. I really don't know, I don't use them. This is a wee little phone. Seems it would be a neat, simple, quick little evening, and then fire the dream. I'll go back to my sanding. With a few clicks on their machine, they can produce the panel templates in any scale you'd find handy, such as 11x17. FINALLY!!!! Looks like it's about time to actually get started! Miss Debbie's counter tops and back splashes will be done next week, and Graham will have the plans in the mail today! I'm SOOOO excited! Graham is providing full size patterns and I'll work out the interior as I go along. If you guys like it, it will become a stock B&B plan. Of course the plans will come with all the great building directions that we have come to expect from them. I'll post a few images from Alan's and Graham's magic computers for you to get a first look. That weird ladder keel will create some drag, and she's still full of water, but she looks sweet! This is my type of boating, here, so, I will be following with interest. NO-NO-NO Tiger. that ain't a keel. That's an optional safety rail to grab on to if ya turn the durn canoe over with that big 150 hp Merc that's some red neck bass fisher guy is gonna hang on the back. I bet that same guy is gonna want the thing in poly flake. Anyway, it's an option that my boat won't have , cause I'm only gonna use my li'l 2.5 Zuki on it. I think Graham and Alan forgot to tape their seams, that's all. When do you start building? Man, I do love you, Chick. I, for one, am VERY interested, because I can't really paddle, anymore, but I love canoeing. I'll be watching with much interest. All I could think of while looking at the renderings was that is almost looked like a mini-Star. 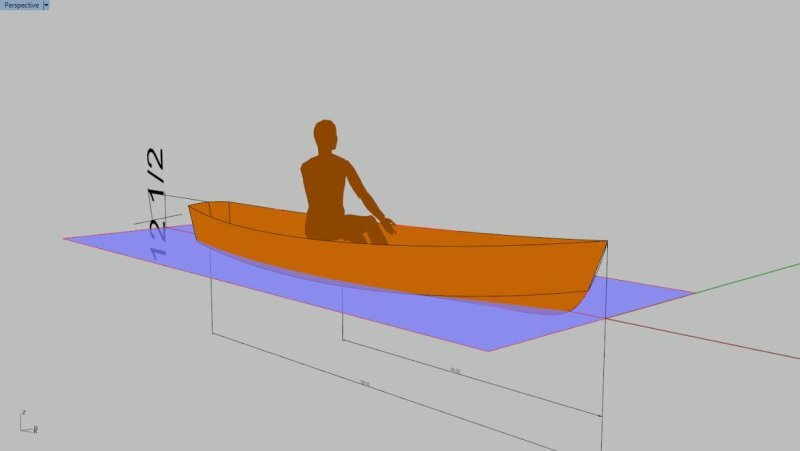 14 feet vs 23 ft- change a few bulkheads and fully enclose for flotation when you capsize. Add hiking straps and thicker gunwales for comfort. You could use a Laser rig (cat rigged) like I did on my Spindrift or go nuts with a Bermuda rig like on a Capri 14.2. Maybe scale it up just a little to 16 or 17 feet to make it a little easier on the two man crew. It should still be around a hundred pounds- not including the rig, sails, daggerboard and rudder. Skinny and long it'll be a blast to sail, but it'll take a lot of skill and hiking out to keep it upright. Just for sport I'd add a motor mount for my cranky old Nissan 3.5 two stroke. You could still paddle like a canoe too. I've always wanted to sail a Star! Never got the opportunity. The running back stays always scared me, though. Did you know they originally had a gaff-rigged main? My old boss, Charlie Morgan raced Stars even while he was building Heritage, his 12 meter. His crew was made up of some of the hot shot sailors that also worked for him at morgan Yacht Corp. As a matter of fact, part of his America's Cup crew were those same guys. Charlie was quite a character! Maybe I'll need to remember some stuff to write a little story about him. And, yes Don, I knew that Stars originally had gaff rigs.